The annual WA Golf Foundation ‘Malaysia Truly Asia’ Charity Golf Day proved another success on a picture-perfect day at the WA Golf Club on Monday, November 20. Seventy-two golfers enjoyed a memorable day out to help celebrate the significant work of a foundation that has raised more than half a million dollars since its inception in 2012. Lakelands Country Club quartet Ewen Trott, Bryan Drake, Dave Martin and John Alchin claimed first prize – a generous stay-and-play package from Joondalup Resort – after their 94-point haul was enough to win on a countback. The day also enjoyed strong support from proud partners Tourism Malaysia and Malindo Air, who offered return flights to Kuala Lumpur for two as a door prize. Matthew Deal, who was a part of the Frogmat team beaten on a countback, earned the significant consolation of that prize after his name was drawn from the hat by recently-retired WA Golf Club general manager Brian Close. The PGA of Australia also donated a World Super 6 Perth pin flag, signed by 2017 champion Brett Rumford, as well as two passes to the Super Suite during next year’s tournament at Lake Karrinyup Country Club from February 8-11. “The WAGF Charity Day has become a much-anticipated part of the local golf calendar and provides an opportunity to reflect on the all-encompassing impact the Foundation has had on growing golf in this state in such a short period of time,” WAGF Chief Executive Gary Thomas said. A programme at Rivervale Primary School – typically a lower socio-economic background – increased its enrolments by 15% due to the introduction of a golf programme coached by Mostyn Farmer. Highly-successful ladies programmes at Bruce Rock, Rockingham and Margaret River Golf Clubs as well as the Lower Great Southern District Association. 67 participants through Mark Tibbles’ First Swing programme at The Vines for those with disabilities with a projection that the programme will increase to 120+ in 2018. The Empower Golf Project which provides disabled people normally confined to a wheelchair with access to a “Paragolfer” – an all-terrain wheelchair that enables golfers that otherwise could not stand to take up the standard golf position. 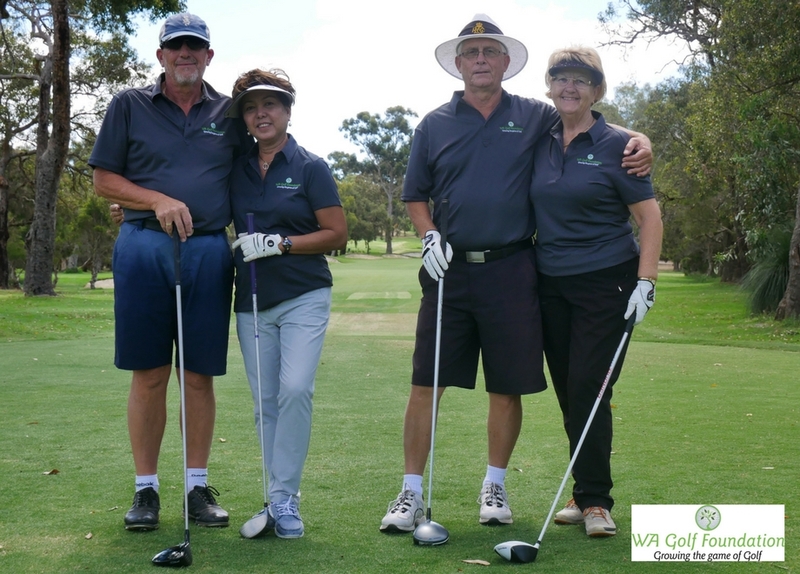 The WAGF also offered special thanks to the WA Golf Club and its staff for providing the course in pristine condition and for the excellent service enjoyed by all of the players on the day. Young Western Australian amateurs Hayden Hopewell and Josh Greer – the latter who won the boys’ Drummond Golf Junior Amateur Championship of WA title the previous day – provided playing support while professional Daniel Hoeve showed his class with a hole in the one at the par-three fifth. For details on how to apply to the WAGF for funding for a golf programme please click on this link.